All eyes will be on you when you enter your next special event in this stunning dress 60269 by Alyce Paris. This dress has a fitted bodice with a sweetheart neckline and off the shoulder cap sleeves. 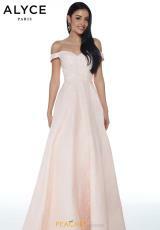 A flattering A-line skirt flares out subtly to finish off this princess-like dress. 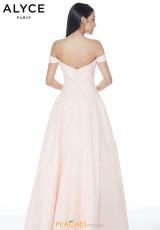 The dress is made in a rich jacquard material in a soft coral shade that gives the dress a sweet and romantic feel.